Mad for Monaco: Happy National Day Monaco! with free bus service after the show. Photos will be posted later. It is expected that, for the first time, Charlene Wittstock will appear on the balcony with the Princely Family to honor the reign of her husband-to-be the Sovereign Prince. Hello, we are students from Carmel High School in Mundelein USA. We are doing a report on religion in Monaco and we couldn't find any other way to contact you. 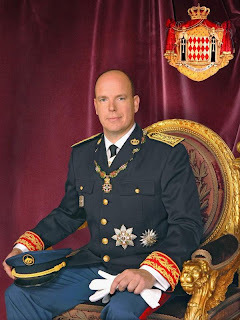 -Do people in Monaco have any special religious traditions and customs? -Are there religious orders and schools? (Catholic Schools, etc. )If so, what are they like. -What are art and architecture like in Monaco, and does it have any religious influences? Monaco, as I'm sure you know, is an officially Catholic country (with complete freedom of religion of course) and so there are many special festivities on Catholic feast days. The most significant and uniquely Monegasque is the Feast of St Devote, patron saint of Monaco. You can find more information on that by clicking on the picture of St Devote on the sidebar here and then, at the bottom of that post you can find more information by clicking on the label "Catholic Church". You can also find more info via the link to the Archdiocese of Monaco in the links section. St Rainier is also a special saint in Monaco and special ceremonies are held on other feast days (like St John the Baptist). I don't know of any specifically Monegasque religious orders but there are two private Catholic schools that I know of, those being the Institution Francois d'Assise Nicolas Barre (http://www.fanb.mc/index.php) and the Ecole des Soeurs Dominicaines. The architecture is pretty common for the riviera with French and Italian influences. When it comes to art there is a great deal and religious themes and themes from Greco-Roman mythology are common. One of the most famous artists to come out of Monaco was the sculptor Joseph-Francois Bosio. You can use the search box or the label "personalities" to find a page about him here as well. I hope that helps and good luck on your project! I wonder if the members of the royal family, who ultimately will gather to celebrate with Albert will play that new Monaco parlor game: Are you one of Charlene's two friends or an acquaintance? I wonder if his subjects will be happy to see her?